Why Is My Dog STILL Barking at the Front Door? Let’s say you’ve been invited over to a friend’s house for dinner. You’ve never actually seen her new place so you’re excited to see what she’s done with it. You show up ,dressed to impress, a fashionable fifteen minutes late and ring the doorbell with a tray of perfectly prepared bacon wrapped dates. When you ring the doorbell all you can see through the glass is a literal flying ball of fur. While it hurls itself against the door like it’s the hockey boards, all you can hear is barking, screaming and total chaos. When your poor friend finally gets the door open she’s got one hand desperately clutching the collar of her eighty pound lab puppy and the other gingerly trying to take your bacon wrapped dates. Let’s just say the entrance ends with the bottom half of your dress ripped off, your friend face-down in a pile of dates and a lab puppy that feels like he’s won the lottery. Been there? Have your earnest attempts at teaching your dog to go to his place and stay there all ended up in failure? There may be some pretty straightforward reasons why things aren’t working out. 1) Your Dog Has Too-Easy Access to the Front Door. Bad behaviours, just like anything else, get better (or worse) with practice. Every time your dog is allowed to run at that door with reckless abandon and rehearse those rude behaviours, he’s learning that it’s working. Furthermore, over time, that entry way becomes so associated with stress and chaos that it’s supercharged. Just being in that general area will cause your dog’s stress hormones to spike in anticipation of what’s to come. Throw in a guest, a screaming owner and an open door and you’re doomed. In order to prevent repeated rehearsals and associations, take steps to limit your dog’s access to that area whenever possible. If you can put up a baby gate, do it. If you can close a secondary set of doors, do it. If you can put frosting over the window to prevent a visual, then do it! You might even want to think about putting your dog away in another room when guests first come over until you can get a better handle on the behaviour through consistent training. 2) Understand WHY Your Dog is Door Dashing. Not all problems at the door are caused for the same reasons. Some dogs just take their job as home Security very seriously, but for others, you may be dealing with a case of either fear of strangers or even territorial aggression. I know I’m splitting hairs here, but it’s important to remember that fear and aggression are often two sides of the same coin, so if your dog is showing what looks like territorial aggression he’s more than likely just extremely uncomfortable with strangers in his home. Learn to recognize the difference between these types of responses. Look for signs of stress and anxiety such as backing away, crouching, ears back, or pacing. If you’re seeing any of these signs, versus an overly excited, happy, hyperactive greeting then you need to talk to a trainer about a protocol to help your dog. 3) Teaching Your Dog to Stay on a Mat MAY Not Solve the Problem. The majority of the time, trainers will teach you to substitute a problem behaviour with a more appropriate behaviour. In this situation, you would teach your dog to go to his bed and stay there whenever he hears the door. There are a couple of reasons I suspect that a lot of people have so little success with this. The first is that it might not be enough to just teach your dog to stay on his mat at the door-you might need to teach him to feel RELAXED on his mat at the door. Those are two very different things. If your dog is sitting on his bed, but is literally twitching with anticipation, you’ve just delayed the obnoxious greeting until later. In fact, his arousal level may actually be growing while he’s sitting on that mat! Talk about cutting off your nose to spite your face. The second reason is that many dogs are actually AFRAID of people who are coming into the home. Because they desperately want to please you, they’ll do as they’re told and stay on the bed, but they in fact, feel LESS safe, because you’ve made it impossible for them to get away. Now, not only are they afraid, but they’re conflicted and anxious. Here’s the thing. I do occasionally teach my clients to send their dogs to their bed when they hear the door bell ring. However, I first introduce the mat on its own and reward the dog for being relaxed on the mat just by itself. The mat should be a cue for immediate relaxation. Then I would slowly introduce other triggers at increasing difficulty. I might have the mat in another room, and knock lightly on the wall, while clicking the dog for staying calm. Then I’d practice with louder knocks and gradually move him to the front of the house. 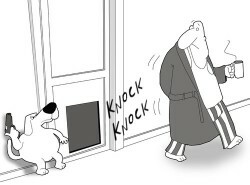 I would eventually add in knocks on the front door, but ONLY when I’m sure he can stay calm, not just stay on his mat. You see why this quickly becomes a challenging problem? If you want to do train successfully my friends, I’m afraid you’ll have to take the time and do it properly. My method of choice has actually evolved away from training mat work near the door. I’ve had much more success with teaching a dog to find his owner when he hears the bell! It’s a very simple technique. Basically, you start at the front door with clicker and treats in hand. Have someone knock, and your dog will run to the door. Wait for him to stop barking. As soon as he turns to look at you, click and treat. Before long, your dog will look at you as soon as he hears a knock! Then you can start having fun with it by moving away from the door, hiding in other rooms and adding in louder knocks. If you can get your dog to seek you out every time the door rings then you can put him wherever you need to, whether it be his mat, his crate, or behind a baby gate.